Good morning stitching world! I have been so busy with the preparations for my workshops in Adelaide, Australia that I haven’t had much time to blog! But I have made a lovely new kit for you that I think you will love. It’s small and uncomplicated and a perfect gift for a friend who would like to start with ribbon embroidery, or to make for yourself! I am making a dried herb and flowers cushion for my mum and will fill it with lovely-smelling petals, whatever I can find when I make the cushion. 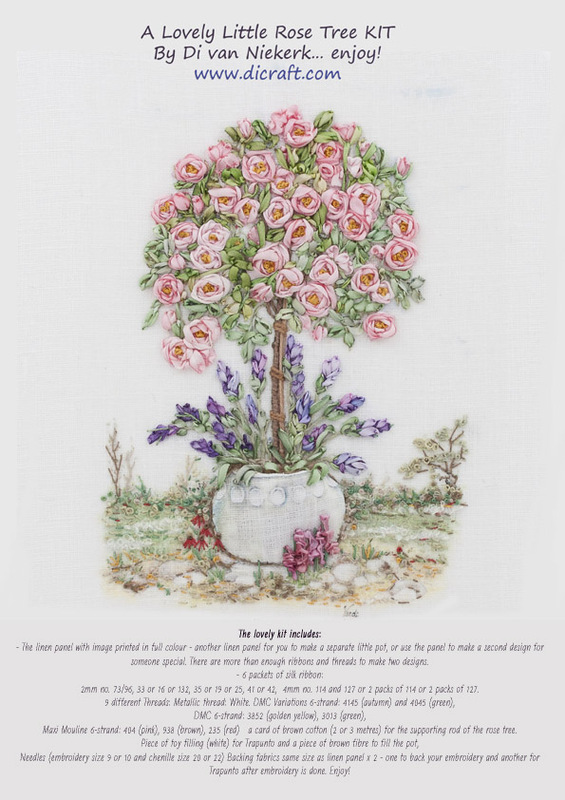 The kit contains the instructions and colour pictures to show you how to make this lovely rose tree, and I will also be teaching it online when I get back as I took step-by-step photographs and will show you in detail how it was done. Have a look here for more details about this lovely little kit. Here is a picture of the completed piece, a lovely little cushion. A herb cushion is also a wonderful idea. The pink border is made with my 32mm silk ribbon number 114. Don’t you love the soft variation in the ribbon border? I will be taking some Rose tree kits with me to Australia (I am leaving for the airport in a few hours) and I am also taking lovely silk ribbons and threads, and the pink delight kits that I am also teaching step-by-step online. Looking forward to the workshops to meeting everyone, it’s always an exciting event for me. Hold thumbs everything goes well! I am teaching a Fuchsia class and so I used some of the samples to adorn this raffia hat, my mum has booked this one! Sumi and the team will be here in Newlands to process orders and to assist with any queries and orders.